Can You Call in This Morning? Chad Siewert has a sign outside his house that reads "911 was an INSIDE JOB." It is located on a busy road and is lit up at night. His Army uniform sits next to it. After talking about Dr Morgan Reynolds, Major General Stubblebine, and Lt Col Robert Bowman questioning what really happened on 911 and talking about the evidence to support their dobts, I was let go. The show then went into attack mode as could be expected. Last week I had mentioned a new advertising medium we might be trying out. Unfortunately we were a bit misinformed on the numbers and so it didn't pan out. So, for now we will go back to running blogads, and with the upcoming LA panel on CSPAN this Saturday what better time to chip in a few bucks? If we can reach $950 quickly we can get an ad on rawstory.com for the CSPAN showing in time for it to be seen by a couple hundred thousand visitors. Right now we are getting about 5,000 unique hits a day, so if everyone chips in it shouldn't be a problem, and I'll kick in the last $100 myself if we get close. They rallied for New York and America in the terrible hours after the World Trade Center collapsed - and ever since, thousands have paid with their health. Some have given their lives. Forty-thousand-strong, they labored at Ground Zero under miserable conditions in a time of crisis, working 10 and 12 hours a day to search for the lost, extinguish underground fires and haul off 2 million tons of rubble. As a direct result, well over 12,000 are sick today, having suffered lasting damage to their respiratory systems. Dylan Avery, maker of Loose Change, just did this firefighter interview. The firefighter liked Loose Change, and calls for a new 9/11 investigation. dz: he also notes that Immortal Technique will be involved with the events for the 5th year anniversary in NYC. I just ordered my copy of Griffin's new book today. Given the popularity of his two previous books The New Pearl Harbor: Disturbing Questions About the Bush Administration and 9/11 and The 9/11 Commission Report: Omissions And Distortions I would assume his new book will be a blockbuster as well. This book is written as a call to the Christian community, and may serve as a sincere ice-breaker to members of that faith. I wrote this article in the hopes that additional witnesses will come forward to either verify or refute this line of inquiry. Does something smell fishy to you? Or is this much ado about nothing? 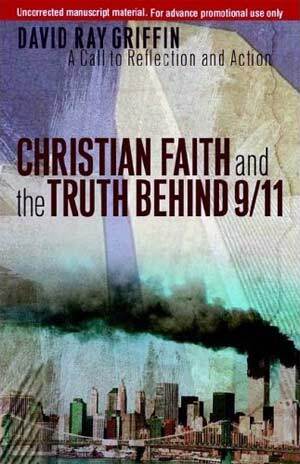 Navy Historian Barbara Honegger says that there are multiple lines of evidence showing that an explosion occurred at the Pentagon on 9/11 at 9:32 a.m.. The official story says that Flight 77 did not hit the building until at least 9:37 a.m.
"I looked at my watch before I looked at the computer, it was 9:30 am. Later that night, I looked at my watch it stopped at 9:30am." Seems simple enough, maybe they are gauging the response to determine if the issue deserves any focus? 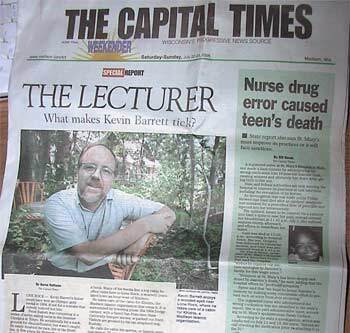 The Capital Times story we covered yesterday, What Makes Kevin Barrett Tick, was this weekends headline story in that paper. 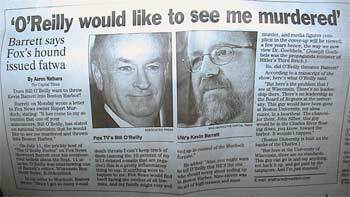 The article covers Barrett in great detail and includes discussion of 9/11 topics, and recent comments on Barrett by Bill O'Reilly. You can find all the scans on yourbbsucks.com here.